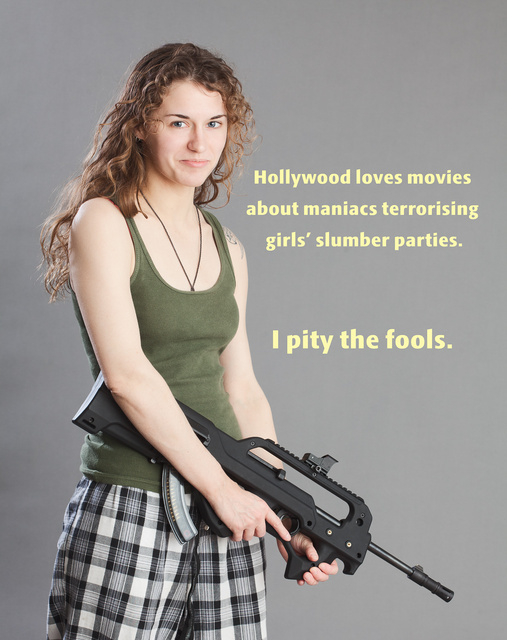 This entry was posted in humor, interesting people, rifle and tagged 22LR, bullpup, girl, plaid, red dot. Bookmark the permalink. Of course your way the movie only lasts about three minutes. Home carry=sweatpants gun. I like a sweatpants gun for laying around the house and for the odd occasion when I know I am really going to get competitive at the feed trough. This young lady has taken the idea to whole new level. You mean the slasher part of the story only lasts three minutes. Good. Then they could get on with something more interesting and I might pay to see a movie once in a while. You need only about 60 seconds. I thought about this ad, then added two minutes to admire half-a-dozen slumber party participants while they decide who will solve the problem.